Renting a 4×4 is the coolest new adventure activity going. A cancelled afternoon flight, a taxi from the airport, travelling 650km overnight to reach Jodhpur, malnutrition, sleep deprivation. Not an auspicious start to an assignment. We reached Osiyan near Jodhpur for our offroad expedition after a fourteen-hour road journey and were greeted by Uday and Ajit, the duo that runs Overlander India. 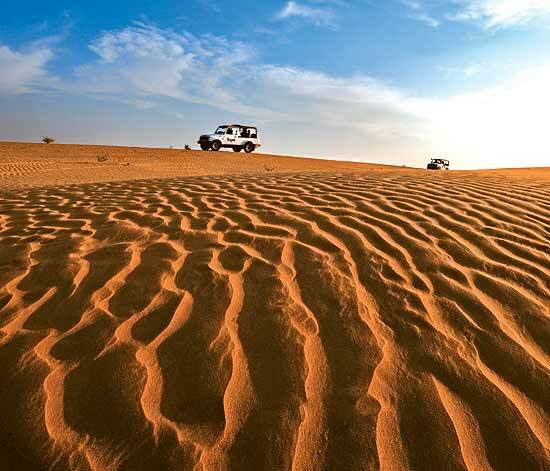 They have embarked on a joint adventure of selling offroad joy in guided tours in and around Rajasthan. They took us to a desert camp with luxury tents where they had waited for us, and where we would have spent the night but for Jet Airways. It was painful to see such comfort lying unused because of a treacherous airline. Outside, the sun was rising over the desert sky, offering refreshment for weary souls. For corporal refection, there was breakfast, over which we discussed our driving route and got to know each other. Uday Bhan Singh is an astute and reserved man, a horse trainer by vocation and an adrenaline junkie by avocation. When training racehorses got boring in Kentucky and Dubai, he rode dirt bikes and drove rally cars. Eventually, he found his calling while drifting in the desert in four-wheel-drive vehicles. He quit horsing around, moved back to Jodhpur, entered a partnership with his cousin Ajit Rana and launched Overlander. Ajit is a gregarious giant whose many appetites include outdoor adventure. He got drawn into the rallying and the 4×4 experience while negotiating steep rock surfaces in Kenya, Namibia and California. Previously, while drawing up our itinerary, I’d asked for a raw and real experience. With such experts for company and a spanking new Maruti Gypsy with only 1,300km on the odometer, I was sure nothing could go wrong. In any case, I had driven a Gypsy in 4×4 mode in the sands of my distant past. How bad could it be? What could go wrong in the safety of the sand? Before we set off, Uday briefed me on offroad safety, explaining when and how to engage and disengage four-wheel drive. He described the mistakes I was likely to make, as an inexperienced offroader. He chuckled and said I would get stuck at some stage or the other, and assured me he would be there to help. I was to follow him at a distance and heed instructions when it got tricky. Ajit hopped in beside me with a wireless set in hand; my colleague Sridhar got into Uday’s Gypsy. By the time we set off the sun had started warming the cold sands on the horizon. Behind the wheel, I beamed confidence, having made it there despite a civil aviation conspiracy. A few kilometres through a sandy track and we stopped next to a set of sand dunes. Uday waited for some camels to trundle down, and then shot up the dune to the accompaniment of engine roar. He then radioed instructions —“Make sure you have full power and that you steer side to side to get grip”—and I set off, all four wheels engaged to the engine, pedal to the metal. About fifteen metres from the top, I ran out of power, the engine stalled. Once you lose momentum on a steep incline there is no going forward; Ajit asked me to reverse all the way down and further back to build speed to climb again. The second attempt was sorrier. Uday told me I wasn’t getting any sideways traction because I was going in a straight line, driving straight into tracks with sand loosened by his wheels. I begged to differ, of course, telling myself that the vehicle I was driving most likely underpowered. I kept my dissidence to myself and backed down again. This is when Uday walked down to me, took the wheel and climbed the dune in one go. I realised I was actually afraid of pressing hard on the accelerator on first gear, a result of two decades of driving on paved surfaces. Once we were on top, I took the wheel and drove right behind Uday in between the dunes, and then descended on to sandy tracks. We soon hit the second set of dunes, much higher than the first. My confidence was significantly diminished by now; weariness was getting the better of wit. I stalled the engine on the first attempt, getting nowhere near the top. I backed up gingerly and had another go. I stalled even earlier this time. I noticed the look of forbearance on Ajit’s face and the sound of desperation in his voice as he gave instructions, which I understood but just couldn’t follow. I was making a right hash of everything. I could feel my ears red and hot with embarrassment, leaving no oxygenated blood for my limbs. My hands felt like hooves incapable of grip as I hit many surfaces around the dashboard and hurt my fingers. The hopelessly spinning wheels merely mirrored my loosening grip on the situation. My third attempt was an exposition of misery. There was a stench I recognised but did not want to acknowledge. Uday nailed it as he walked down: “You are burning the clutch plates.” In my despondence, I was doing what novices do when they are unsure: hitting the clutch at high RPMs, which burns them out and reduces the delivery of engine power to the wheels. Uday took over again and drove straight up without fuss. I took over, and we were driving through pastures. In the past I have travelled to these parts of the Thar desert to document its succulent grasses which have sustained hundreds of generations of livestock rearers, describing their many values and how well they have adapted to the desert environment. Now, I was trampling all that beautiful vegetation in a petrol-guzzling car for cheap thrills. I could feel the guilt of perpetrating environmental injustice. When I got stuck next, Ajit and Uday had creases of worry on their faces as they discussed what to do about the clutch. Uday mentioned sending somebody to Jodhpur to get a new clutch, as he turned his face to desirously survey some dunes in the distance, where we would have reached by now had I not pooped the party. I was a picture of sorriness by now, all fuzzy illogic and frayed nerves. A seriously well-planned adventure was becoming a weekend at the garage because of my incompetence behind the wheel. I wished for the Thar sands to part and engulf me, delivering me from my humiliation. Ajit was nonchalant. He took over from me even as I got into Uday’s Gypsy to observe how he was negotiating the terrain. Watching the master at work immediately had a calming effect. While he drove, he tinkered with the GPS, shot videos, talked on the radio and discussed cultural matters. I could see why it is so difficult to follow him: his decision-making is very complex, a result of several years of driving offroad. He has honed his instincts to finding every inch of grip in the terrain. Ajit, meanwhile, was in trouble, looking like a grown man driving a toy car. He is 6’4” tall. Maruti did not design the Gypsy with him in mind. He cursed all and sundry on the radio, and Uday started kidding him. The clutch had not burned out entirely, so I emerged from the throes of guilt, took the radio and nagged Ajit about his fondness for food. We reached a set of large dunes, at the base of which a sumptuous meal was being laid out for us. As the others got off to rest on mattresses covered with clean sheets, Uday and I got into my car. He drove straight up and we found ourselves on top of rolling dunes which offered commanding views all around. Uday drove in the middle of all this with the vengeance of somebody appointed by the United Nations Convention to Combat Desertification. If a slope seemed too steep for his speed he turned away at strange angles to circle around, gather greater momentum and surge with all the break horse power at his disposal. He gave me the wheel and I did the same. As I glided over the sand in second gear, I could feel the blood rushing through my body. Adrenaline, the prodigal, had returned. I now had a smile on my face, so Uday asked me to take the car to the edge of a precipice and stop. He took the wheel and drove forward. The drop was smooth and exciting and brought us back to where lunch had been served. I was all appetite. After lunch, I took the wheel. Now familiar with Uday’s complex approach, I knew there was no sense in trying to follow him closely. So I concentrated on the terrain and anticipated paths amenable to traction. My foot reached for the clutch only to shift gears, and I was sure of where to engage four-wheel drive and where to use two. In fact, I was now using the radio while driving and ticking off the master for his mistakes. I attacked a steep climb with momentum and engine power on my side. I could keep the nose straight down sharp slopes. I’d finally got the hang of it. We reached a heritage hotel around sundown. A hot shower, a hot meal, clean sheets. I slept after two days. On day two, we drove through rolling pastures flanked by dunes. It had now become an exercise of skill. Along the side of a dune, I caught my first drift. The car was pointing upwards but moving sideways along the incline and I was actually in control. I was surfing a dune. We climbed on to the most beautiful dunes I have seen and went berserk. Ajit and Uday now had a different kind of worry. I got stuck a couple of times, digging myself in with a heavy foot on the accelerator. But it was not all that bad; an error of commission was preferable to an error of omission. I was avoiding Uday’s tracks and deciding for myself. He went around a dune and I lost power, losing sight of him. I backed up to a point where my nose was pointing downwards, gathered momentum and floored it, taking a narrower, straighter path. I didn’t know that Uday had gone around to avoid a steep incline. For a few moments, all the four wheels lost drive as the car leaped into the air. I’d managed to get off the ground, which is more than could be said about the Jet Airways flight which was to deliver us to Jodhpur. I landed on a patch of soft sand with a favourable incline and drove through. At the far end, I could see Uday and Ajit looking my way in dread. When I reached there, Uday chastised me; I could’ve hurt myself or damaged the car. I hung my head and heard him out, remembering being summoned to the principal’s office after teachers’ complaints. Inside, I was smiling like I used to smile back then.